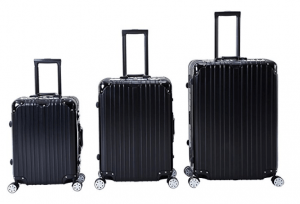 The Orkan Luggage Set (or the individual suitcases) that we’re reviewing on this page has a unique aluminium frame design and is lightweight despite having a hardshell exterior. The suitcases are made of solid and sturdy premium ABS plastic and a polycarbonate material with the strengthened aluminium frame. You can choose from four different colours of black, deluxe silver, economic silver and rose golden. There are three sizes of suitcases in the set- 20, 24 and 28 inches and all have the TSA lock. You can use these suitcases for your different needs on different types of leisure and business trips of varying lengths. The largest bag measures 20.4 x 11.4 x 28.7 inches, the medium 24” bag is 16.9 x 9.8 x 23.6 inches and the smallest cabin bag has the measurements of 16.1 x 9 x 20 inches without the wheels or handles. You can use the largest 28” bag for longer trips of more than a week, the medium bag for a few days and the smallest cabin bag for a couple of days. The aluminium alloy on these suitcases in the set are put through thousands of strength tests and stays untouched. It is totally resistant to any impact, pressure, heat and scratches and is waterproof for when you take it out in the rain. 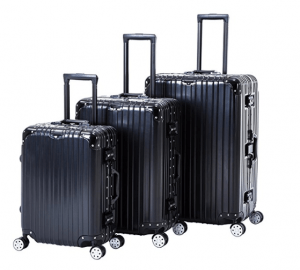 The bags have the four double ergonomic multi-directional spinner wheels and solid telescoping handles and you can move the luggage 360 degrees in all directions effortlessly. They roll very quietly and you will hardly feel any weight on your arms. The spinner wheels are removable if you ever need to change them. The telescoping handle is made of very solid aluminium and you have the softer side handles and you can lift the bags vertically or horizontally. These bags are not expandable but offer plenty of space inside for your different belongings. You’ll find two cross straps on left and right sides and will keep your clothes in place. There are also zippered pockets for your smaller items and to keep everything well organized. You can pack more without having to incur extra weight charges by the airlines’ thanks to its sturdy yet lightweight design. The company offers 24-hour customer support and you can contact them if you encounter any problems after purchasing the set or one of the 20”, 24” or 24” bags on their own. Total quality is guaranteed except for any damage that may be caused by you or the way you handle the luggage.